Last autumn I discovered Crafting Interpreters, a book by Bob Nystrom that gives readers a comprehensive guide to writing interpreters for a toy programming language, Lox. To me the world of compilers and interpreters has always been a total mystery. Okay, so I know what a syntax tree is, and I've occassionally even been brave enough to look at the assembly output for a program I've written. Also doesn't parsing need to happen at some point? Anyway, I was pretty intrigued, so in I dived. A friend and I were discussing the relative merits of LabVIEW the other day. Coming from a theoretical, software-focused background, I struggle with LabVIEW, which I think hides too many of the underlying workings of a program from the user for the sake of simplicity. My friend, on the other hand, does a lot of experimental engineering work and loves that LabVIEW frees him from the need to look at line after line of code. Note: This shitpost was originally going to be titled "Windows 10: My Take", but I changed it, for reasons that should become immediately apparent in the next paragraph. You know what really pisses me off with Microsoft's latest OS offering? Windows fricking update. Specifically: why Microsoft hasn't addressed the age-old problem of having updates that can only be installed during the shutdown/restart process. So the title of this post was originally going to be "New Job! ", but since I've been in my current post since September I figured that might be a bit misleading, so I added some lovely quotes to make it feel less like a blatant lie. I'm acutely aware I haven't written here for... [looks for last post] nearly six months. This is mainly due to being busy, which in turn has fostered a "sure, I'll write another blog post, when I have time" sort of mentality. I started thinking this in September and, well, here we are. It's been a while since I last posted here. Sorry. I hope you can forgive me in the fullness of time. So Thursday the UK decided to leave the EU for some bizarre reason that I still don't fully understand. Many of those who voted to remain feel angry and cheated out of what may have been a more prosperous future than they are now faced with. However, I don't want to rant and rave about how we've made a terrible mistake. I've already done that on Facebook. Hello! Belated merry Christmas and a very happy New Year! Right, now the social niceties are out the way let's get down to it. I play World of Warcraft (WoW). There, I said it. No Some shame. I also run Linux. LMDE 2 Betsy to be exact. That's Linux Mint but based on the Debian repositories, so I'm not shackled to the whims of Canonical. WoW is targetted at Windows and OSX, but that's okay, as Wine handles WoW fairly well. 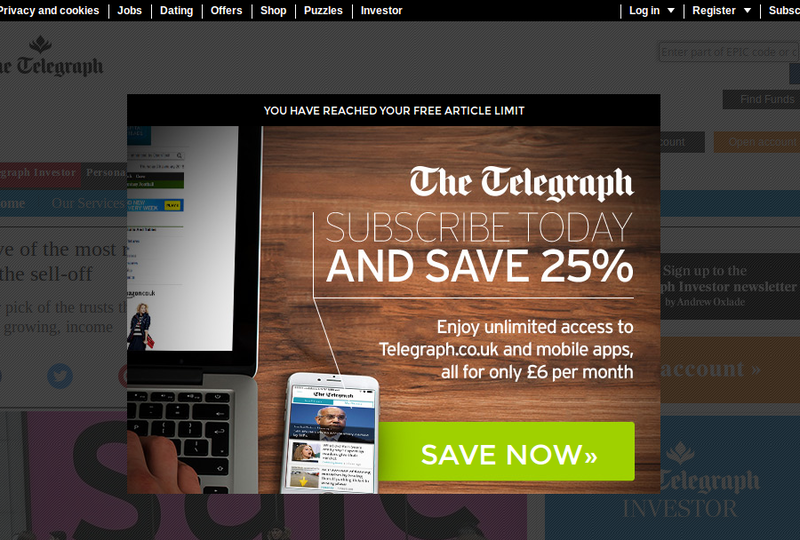 Today I discovered how easy this is to get around: just delete the cookies The Telegraph deposits on your computer. To do this on Firefox, check out this link, and for Chrome, check this link out. Finally, for Internet Explorer, click here for IE 6 to 9 and here for IE 10 to 11. I didn't put Jeremy Corbyn on my ballot for the Labour leadership. He came across as very genuine during the leadership campaign, but I just couldn't get behind his policies. We lost the election because we didn't appeal to enough of the electorate, so running for the leadership with policies that only appeal to one segment of society seemed like pure folly. The latest in the franchise doesn't quite capture the charm of the original, but with plenty of nods to the first film, eye-popping visuals and intense action scenes, you'll be thoroughly entertained to the end.